The LX club players and supporters, who travelled to this enjoyable annual fixture, were happy to play in brilliant sunny weather, after the heavy rains all week. 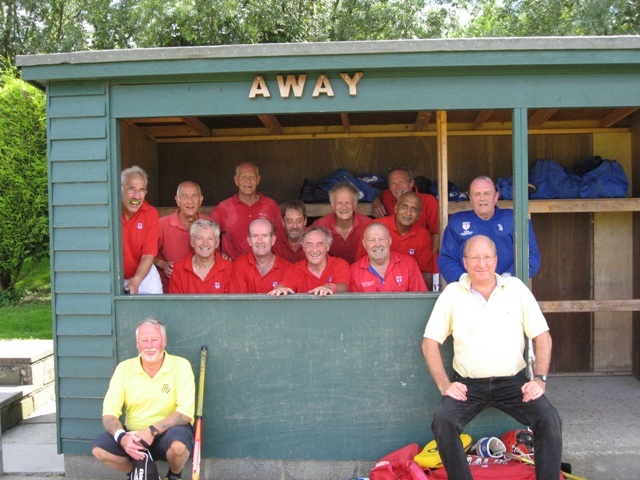 The Lewes team, which had been augmented with players from other Sussex and Surrey Clubs, looked to be formidable opposition, and the LX Club had strengthened their team with Steve Hattersley (Trojans) as a guest player, to match the 53 year old Lewes player who had been drafted in at a very late stage. The first quarter started with LX having to defend resolutely with John Widgery and John Longden tackling well, and Tim Pollard in cracking form, keeping out three well struck Lewes penalty corners. However, fortunes were suddenly reversed when John Longden hit a precise pass to Alan Jackson, who slipped the ball to Gordon Small, the latter beating his marker and the Lewes goalkeeper for speed, and putting LX Club 1-0 ahead. This slick movement was repeated again a few minutes later - John Longden moved the ball to Steve Hattersley, whose excellent pass to the quick Gordon Small, meant the centre forward was again able to round the goalie to make the half-time score 2-0. With the temperature rising to the mid 20’s for the second half, LX knew it would be hard going. However, Peter Ross and Sudesh Nayar at right and left half respectively, injected extra skill and determination into the game. Against the run of play Lewes eventually scrambled a goal following a penalty corner with Geoff Dennis, pushing home a loose ball to make it 2-1. Lewes were now tiring as Captain Alan Jackson rotated his squad well, and with Tony Williams and Keith Hedley really stretching their younger opponents, and John Davey at centre forward distributing the ball well, LX started to get several penalty corners. It was from one of these that Adrian Money, following a smart interchange of passes with Alan Jackson, scored with a powerful shot to turn the game into a brilliant 3-1 well deserved win for the Club. Overall for this fixture LX Club now have 4 wins, Lewes 2 wins, and there have been 3 draws. Many thanks go to Keith Novis and Paul Benoy (Sussex County Umpires) for umpiring, and to the staff of the Circa Restaurant in Lewes who provided an excellent meal, and the wives from both sides, who came along to support. LX Club team: Tim Pollard, John Widgery, John Longden, Peter Ross, Steve Hattersley (Guest), Sudesh Nayar, Tony Williams, Adrian Money, John Davey, Gordon Small, Alan Jackson (Capt), Keith Hedley.